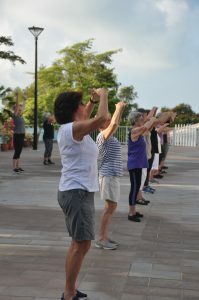 Tai Chi classes for seniors are held at COTA NT in Spillett House on Tuesdays (with the exception of public holidays and instructor ‘rest days’). 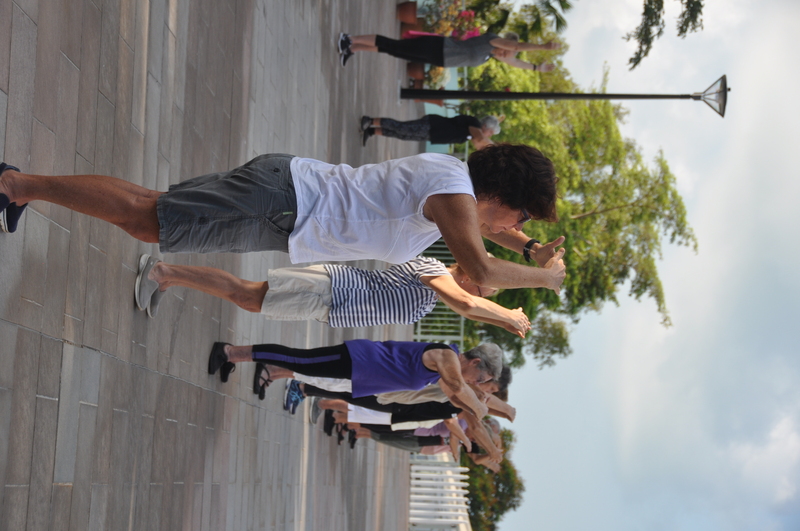 Tai Chi is part of our Fit for Life program, which encourages seniors to stay healthy, grow stronger and to improve their balance, flexibility and co-ordination. meet your instructor, Bernard (Bernie) Lee. Tai Chi is an ancient traditional Chinese martial art. It is a combination of meditation, controlled breathing and martial art techniques. It is characterised by contrasting and complimentary movements which are slow and low impact while practicing breathing exercises. It approach is holistic, considering physical, mental and emotional wellbeing to achieve whole body harmony. It has been described as “medication in motion”. The Sun style is the youngest and simplest form of Tai Chi. It was created by Sun Lu-tang (1861 – 1932). Sun Tai Chi is smooth movements where one foot moves forwards or backwards, the other foot follows. The stance is high, without squats or bending, ideal for seniors and perfect for beginners and people with painful chronic illnesses. The routine is also compact, therefore requiring little space to practice in. There is bountiful evidence that Tai Chi improves people’s physical health. This is important due to the rise of chronic illness in Australia. The Lung Foundation shows that 1 in 7 people over the age of 35 years has some type of chronic obstructive respiratory disease, this increases to 1 in 3 over the age of 75. Evidence shows the breathing in Tai Chi provides improvement in these conditions. The Australian Bureau of Statistics 2014-2015 survey suggests 15.3% Australians have arthritis. Medical evidence shows Tai Chi movements enable people with arthritis to be active without aggravating their symptoms. Further evidence shows Tai Chi is beneficial for those rehabilitating after cardiac illness and strokes. Evidence also exists that Tai Chi benefits mental well being. Beyond Blue figures show 3 million Australians are currently living with depression, that is 1 in 6 women and 1 in 8 men. Anxiety is the most common mental health condition, effecting 1 in 3 women and 1 in 5 men. Older Australians are more likely to experience these issues due to experiencing contributing factors of physical illness and personal loss. Tai Chi can be used as a mindfulness strategy to help manage these conditions. It has also been shown to improve people’s sleep. Tai Chi has also been shown to decrease the risk of older Australians falling. 30% of Australian’s over the age of 65 years fall at least once a year. This figure is set to grow as the number of older Australians increase. Tai Chi participants grow their body and space awareness as they focus on creating smooth body movements and position changes. It also strengthens the participants’ ankles and knees, important in avoiding a fall, and minimising trauma when a fall occurs. It is safe and suitable for children, adolescents and seniors.